Dor Saar of the University of Maine (15) drives past New Hampshire's Brittni Lai during a 2018 game. Point guard is the most important position on a basketball team. The point guard is the floor general, runs the offense and has the ball more than any other player on the team. 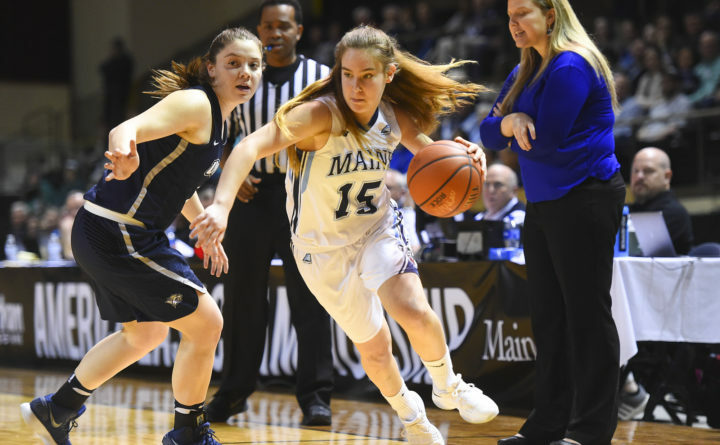 Dor Saar had a memorable 2017-2018 season at the University of Maine when she was named the America East Rookie of the Year, but the diminutive point guard has taken her game to a higher level this season. Saar is among the best ball distributors in the country, averaging 5.4 assists with a 2.62 assist-to-turnover ratio that ranks 18th among 349 Division I teams and second in America East. Her 118 assists place her 19th. She averaged 2.9 assists with a 1.3 assist-to-turnover ratio last season. In her last three games, Saar has registered 21 assists with only two turnovers. With the 5-foot-6 sophomore leading the way, UMaine’s 1.42 turnover-to-assist ratio and 11.7 turnovers per game are both ninth best in the country. “I told her if she ever gets into coaching, having a point guard like her makes life a lot easier. It’s hard to explain how valuable a good point guard is,” Vachon said. The Black Bears (15-7) shared first place in America East with Hartford with an 8-1 conference record entering Wednesday night’s home game against Vermont. Rossignol was impressed with the way Saar came in and took charge as a point guard her freshman year. “She has no fear,” Rossignol said. Saar, a native of Ma’anit, Israel who is also averaging eight points and 2.5 rebounds per game, has always played point guard. She knows what it takes to be a top-notch point guard. Saar has been happy with her assist-to-turnover ratio. Vachon said Saar works hard at all aspects of her game and spends more time in the gym than anyone on the team. Saar said she has made significant strides this season because she is more confident and more comfortable with her teammates. “My role is bigger and I’m a better passer because I know everybody much better, what they like, where they like to get the ball, which spots they like to shoot from,” Saar said. Saar has spent a lot of time working on her shooting and it is paying dividends. Over the last four games, she is averaging 10.8 points on 16-for-26 shooting (61.5 percent) from the floor including an 8-for-17 showing from the 3-point arc (47.1 percent). Senior guard Tanesha Sutton said Saar complements her playmaking skills by creating shots for herself.